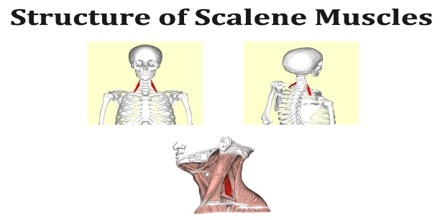 Scalene muscles are a group of muscles consisting of the scalenus anterior, scalenus medius, and scalenus posterior. These muscles are located toward the side of the neck and attach the neck vertebrae to the 1st and 2nd ribs. 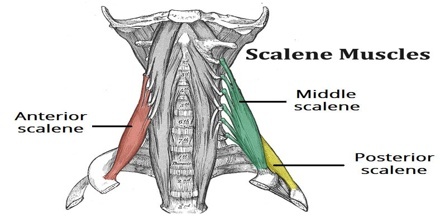 Scalene muscles are three paired muscles of the neck, located in the front on either side of the throat, just lateral to the sternocleidomastoid. There is an anterior scalene (scalenus anterior), a medial scalene (scalenus medius), and a posterior scalene (scalenus posterior). They derive their name from the Greek word skalenos and the later Latin scalenus meaning “uneven”, similar to the scalene triangle in mathematics, which has all sides of unequal length. These muscles not only have different lengths but also considerable variety in their attachments and fiber arrangements. 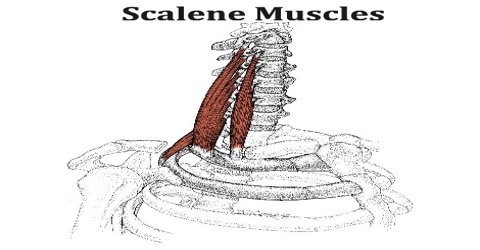 The anterior and middle scalene muscles can be involved in certain forms of thoracic outlet syndrome as well as myofascial pain syndrome, the symptoms of which may mimic a spinal disc herniation of the cervical vertebrae. Since the nerves of the brachial plexus pass through the space between the anterior and middle scalene muscles, that area is sometimes targeted with the administration of regional anesthesia by physicians. The nerve block, called an interscalene block, may be performed prior to arm or shoulder surgery. The triangle between the scalenus anterior muscle, the scalenus medius muscle and the first rib form the interscalene triangle. The subclavian artery and the brachial plexus pass through this gap. In contrary, the subclavian vein runs ventrally from the scalenus anterior muscle. The passing of the brachial plexus and the subclavian artery through the space of the anterior and middle scalene muscles constitute the scalene hiatus, the term “scalene fissure” is also used. The region in which this lies is referred to as the scaleotracheal fossa. It is bound by the clavicle inferior anteriorly, the trachea medially, posteriorly by the trapezius, and anteriorly by the platysma muscle. Reference: gustrength.com, kenhub.com, 4danatomy.com, wikipedia.